We train our Students to the best of their ability. As a student, you are looked upon as an individual, never compared to anyone else. Our instructors will be there every step of the way. All that is expected is a willingness to try. What values are learned through Songahm Taekwondo? 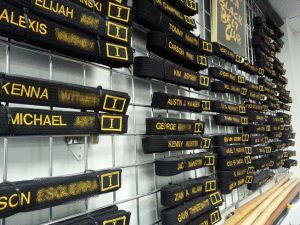 When a student enters a Songahm Taekwondo classroom, the focus of his or her training is not only on physical strength and growth, but also on important skills that will help lead to personal successes in life. These life skills will benefit our students inside the ATA classroom and beyond. After all, a healthy individual is characterized by a strong body and a strong mind. So you can attack any curve ball life throws your way.